that attract large numbers of people – Fairview is the exception. This estate is owned by Charles Back who has been an innovator in the wine industry and has continually experimented with varietals that have not been planted before in South Africa or else have only had limited plantings. In addition to his Paarl estate, he has an estate called Spice Route up the West Coast and also sources grapes from various areas. He is best known for his Shiraz, although, the wines are consistently good across many varietals. Fairview became famous for its goats cheeses in the 1980’s and today they have expanded into cow’s milk cheeses. Their cheeses are available in every supermarket in the country and as such the locals always make a pilgrimage to Fairview when they visit the Cape – which goes some way to explain the crowds when you visit. The secret is the walk straight past the “tasting pods” in the tasting room and to head through to the quiet peaceful room at the back where you can do the sommeliers tasting of the day – in the Beryl Back room you will be able to taste 8 of their top wines paired with the farms cheeses. Please note that you are welcome to ask to taste any of the wines that are not on that days list. I would highly recommend this tasting experience as the wines are excellent. Note that Fairview have now set up a depot/agent in California – this allows them to make deliveries from the depot using local couriers – as such they can do you a quote in US $ and the prices are really reasonable. On the estate one of the highlights is the goat tower. 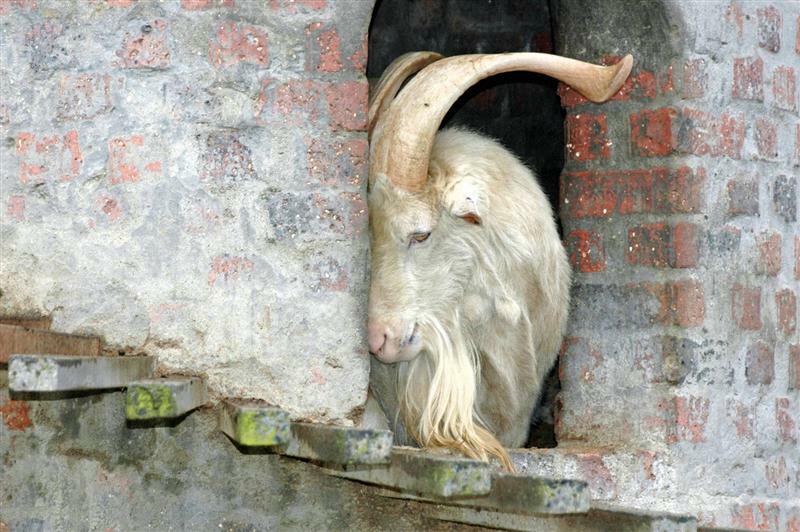 Here some of the goats that are retired from the herd are in a pen with a tower – it is great fun to watch the goats climbing up and down the tower. The Goat Shed Restaurant is also delightful. They bake their own ciabatta bread and do wonderful cheese & meat platters in addition to their a la carte menu. Note that one should also visit Charles Back’s second estate – Spice Route – which is two farms further along the same road. Spice Route Wines– about two farms along from Fairview (and has the same owner as Fairview – Charles Back). Charles is aiming to turn Paarl Winelands into a “must do” destination in the Cape Winelands………..and is succeeding admirably. He has used Spice Route to create an artisan playground of fun in the winelands…….. a foodie destination from heaven! Fun for foodies, wine lovers, beer lovers, families……..well everyone! I would highly recommend a visit to Spice Route- however note that it gets very very busy on weekends! There is so much to do on the estate that it is likely you may not leave once you arrive. Start your visit with a stop at DV Artisan Chocolate. Here you have the opportunity to explore a bean to bar chocolate factory and do a single origin chocolate tasting from a variety of regions around the world. It is an awesome opportunity to learn more about how real chocolate is made and it is a “must do” visit for foodies! Note that if you can roast cocoa beans, you can roast coffee beans! As such DV Chocolates is now roasting Ugandan Coffee beans and have opened a coffee shop just below their factory. Here you can unleash your sweet tooth and combine a coffee with a chocolate creation – from brownies to chocolate cheese cake! Next pop into the Cape Brewing Company (CBC beer) for an educational tasting in a working micro brewery. The staff do a wonderful job teaching you about how different types of beers are brewed. This is a fab one to visit as South Africa is only at the start of the journey on artisan breweries – and as such this is a complete hit. As such it is best avoided on weekends as the locals have found it and love it! From here you head down the stairs to the Spice Route Wine Tasting area and Richard Bosman Meats. The Spice Route estate is actually located in a region called The Swartland. However there are not a lot of visitors that pass through this area and as such it was decided to host the tasting room in Paarl. This is a great opportunity to taste wines that are pre-dominenantly grown from “bush vines” (vines that are not trellised – they grow the old fashioned way – close to the ground.) These vines are also not irrigated. As such the crop that results is smaller and the berry sizes are smaller – meaning a higher skin to juice ration. This results in a fantastic intensity of the flavours of the grapes. The focus is on heavier grape varietals such as Shiraz, Pinotage and Mourvedre. They also offer some interesting whites! This is an interesting wine experience – especially if you have not been exposed to bush vines before! At the tasting room you can do a straight tasting, or you can pair with chocolate (however I would highly recommend going and doing the chocolate tasting experience on its own as it is a fascinating journey learning how chocolate is made.) or with the charcuterie meats (recommended – Richard Bosman’s meats are wonderful!) Note – pay the extra to taste their flagship wine – The Malabar – it is worth it! It is a great red blend! Richard Bosman Meats – Richard Bosman is a pioneer in our market in the field of making charcuterie meats. South Africa had no history of making cured meats other then biltong/droewors/bacon. As such Richard had to learn through trial and error and travel to learn this ancient art. He is highly acclaimed locally and many of our chefs purchase his products and support him. If you have a fascination with learning more – then pop into their little shop for a tasting and to have all your questions answered! Red Hot Glass – this is a glass blowing studio where you can actually watch them doing the glass blowing. The pieces are contemporary and really beautiful. It is well worth popping in to visit the store – which is located next door to the Bertus Basson Restaurant. La Grapperia – Keep walking after red hot glass and you will find the Grapperia! Here you will find the Wilderer Distillery and can taste their schnapps and grappas. In addition you will find a very chilled out restaurant with great pizza’s, flammkuchen and tapas. This is a lovely lighter option for lunch. It is also reasonably priced and in summer you can sit outside and have the kids play area which is easily accessible and easy to watch. It is also a cozy venue in winter as they have a lovely large fireplace. Landskroon – next door to Seidelberg – if you have sweet tooth and enjoy Port – pop in for a tasting here. Very reasonably priced wines and ports. Domaine Brahms – is owned by Gesie van Deventer who was one of the first South African women to become a wine maker. Her struggle to make her name is inspirational. A few years ago, Gesie won winemaker of the year – a great accolade acknowledging her wine making skills and accomplishments. This is a fun one to build in if you wish to experience a smaller cellar. Visits are by appointment only and they are best know for their Shiraz. Doolhof – (Wellington) – is a fun estate to find! It is quite simply a gorgeous drive to get there. They have a good range of wines and I particularly enjoy their Dark Lady Pinotage and the Malbec. The tasting room staff do a great job – but if you want to spoil yourself, book with the winemaker to do a tasting with you. He is very down to earth and it is fun to be able to chat to him. Doolhof means Labyrinth is Afrikaans and true to the name, there is a fun labyrinth that you can go and walk around it. Beware of the lovely horses as one attacked me from behind and bit me on the back! (I was on the other side of the fence and he still got me!). Doolhof is a delightful farm setting and it is gorgeous in this part of the Cape. In addition it is well off the tourist track – so expect to have the place to yourself during the week. Note that they have a very beautiful 5* guesthouse on the estate called Grand Dedale which is a perfect country retreat. Dunstone – (Wellington) – next door to Doolhof. They have a fantastic Shiraz (5 * in 2010 John Platter Guide – later vintages have also been gathering awards!). Note this is a really small operation and the tasting room is very rustic. Since my last visit they have launched a bistro and accommodation that looks lovely! Rheebokskloof – offers quad biking, horse riding, a restaurant, picnics (must pre-book), a hiking trail, boules and a child minding service over weekends. It is a very picturesque estate and as such hosts many weddings. The wines are award winning and I do need to pop in again to try them out! The wine tasting area was able to host big groups, which is why I possibly have not been there for many years! Note that both the quad biking and horse riding are offered by a separate company on the estate. Their services are not easy to secure for foreigners as they require pre-payment prior to coming and do not answer emails or voicemail messages. As such it is easier if you are local and want to chase them for bookings. Diemersfontein (Wellington/edge Paarl region) – is home to the controversial “coffee” pinotage. This is made using barrels with a heavy toasting. The result is a chocolate/coffee taste and nose to the wine. It has been a runaway success in our market – however many in the wine fraternity do not agree that it is a good addition. Feel free to bring up the debate while you are here – they get pretty steamy about it! This estate has a couple of different pinotages to try – so it is a good one to include if you wish to learn more about pinotage or are a pinotage fanatic! Note they also have a pinotage festival here once a year! Druk My Niet – this was a favorite of mine – an amazing winery. Sadly most of it burnt down in the fire in January 2017. Veenwouden (by appointment only still!! I thought that after they built a tasting room it would make it easier to visit them! Alas no!) I love their wines – however I have still not been to the estate as it was so difficult to get a booking in the past. I believe it is now easier to visit them and plan to make a booking soon! They have a great chardonnay (a favourite of mine) and merlot. Good Syrah and Bdx Blend. Noble Hill – has American owners from California who have added a lot of value to the estate. The tasting room is great and a real gourmet treat. Here you can taste the estates wines (I love the Viognier) and their olive oils ….as well as have a light snack. Next to the tasting room is the gorgeously decorated Cosecha (Harvest in Spanish) restaurant. Here you can have a coffee or try out their Mexican dishes. The food is excellent and it is brilliant value for money. Note that the restaurant is mainly outdoors – so it is great for a lovely clear afternoon. The setting is lovely and they have really good taste – I love the Cactus wall. Noble Hill is now also offering Latin inspired picnics that look fabulous for summer. Note this estate is a good choice for kids as well as it has a kids play area, lawns that they can riot on – picnic hampers for kids as well! Backsberg – has gone Carbon Neutral – they keep planting trees to offset their carbon footprint at the estate. Their aim is to produce quality wines while maintinaing a strong ethos of eco-responsibility. They offer good wines at a good price – and a wonderfully large range – so this is a good stop for everyone from white to red wine lovers. You stand up at the counter and taste wines – which is not my favourite type of tasting – but the wines are really lovely. Backberg is fun to visit on Sundays as the restaurant has an old fashioned sheep on the spit and often has entertainment (usually a guitar player). The lamb is available during the week, but the restaurant is most festive on weekends. The estate is kid friendly. Anura – if you are a cheese lover this is definitely worth a stop. The Brie and Camembert cheeses are great and are of the type that if you leave them out of the fridge for an hour – they start oozing on the plate! They offer their cheeses for tasting with the wines – the brie cheeses are impregnated with pepper corns or green figs or available plain. Anura now also has its own microbrewery called Wagon Trail Brewery and offer beer tastings (closed on Mondays). They also offer a wonderful lunch venue for light country lunches (uncomplicated but definitely foodie dishes!) and picnics. Since the start the Bouma family has had fun with the estate – from playing with different cheeses to planting wine varietals that no one else had – the estate has a fun selection of wines to try and is now a one stop shop to have a variety of experiences. It is vibey and the well priced lunch menu ensures that it is a very popular venue over weekends. Note they are open on Sundays and that this is a kid friendly venue.